Letter No. 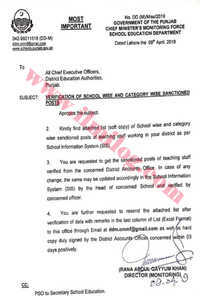 DD (M) MISC/2019 for Verification of School Wise and Category Wise Sanctioned Posts 2019 by a government of Punjab CM chief minister's monitoring force SED school education department dated Lahore the 09 April 2019. 4 You are further requested to resend the attached letter after verification of data with remarks In the Last column of List (Excel Format) to the office through Email at ddm.cmmf@gmail.com as well as hard copy duly signed by the District Accounts office concerned within 03 days positively.